If you are looking for high-quality motorcycle insurance, Bikesure, Adrian Flux's specialist motorbike department, can save you money with a range of policies. As a specialist broker, we can find a policy to suit any motorbike, trike or quad and insurance for classic or customised bikes is no problem. Our plans include agreed value cover and discounts for limited mileage. If you need motorcycle insurance for a big-name bike, we have special deals for Harleys, superbikes and classic bikes. As part of the Adrian Flux Insurance Group, our aim is to provide policies to suit the individual needs of the client. This personal and bespoke approach to providing motorcycle policies has put us at the forefront of specialist vehicle insurance for over 25 years. With great rates for younger riders, learners, experienced riders, commuters and enthusiasts we offer a complete low-cost, high quality service to all motorcyclists. And we will still give you a great value quote when other insurers are left scratching their heads in confusion our wide range of exclusive schemes means that we can offer a tailored service, ranging from top quality cover for classic bikes or modern Chinese imports right through to the mammoth cruisers and awesome scooters on the market today. All our policies are designed to suit your needs and we have specialist departments who can match you up with the perfect policy. No matter what you ride, from Adly to Zhongyu, Aprilia to Yamaha, we can insure it. We can even offer you agreed value cover and discounts for limited mileage. Click here to get a quotation on your BIKE, TRIKE, SCOOTER or QUAD. So whether you have a classic low-rider, superbike, a scooter, a naked bike, enduro, trike, quad or just a funky moped we have a policy just for you. If you've bought, or are thinking of buying, one of the fantastically cheap chinese imports for sale, perhaps on Ebay, you may find that you run into problems with some insurance companies, who won't cover a make they've never heard of. Because we're enthusiastic about bikes, we have heard of most of them. But we will give you a great value quote even on a make we haven't yet heard of, because our personal service means we can investigate the specifications of the bike and get you an appropriately cheap quote. Due to the type of Bikes insured our policies are designed especially for the out of the ordinary and our highly trained underwriting staff have a high degree of knowledge in this field. You can get a quote and buy a policy online, but often our best rates are available on the phone. That's because each risk will be individually calculated by our expert staff, who can apply their judgement and experience to cases that would only be offered a standard rate by a computer. Please note that our sales staff are insurance experts, based in the UK, not just button pushers and along with our tailor made Motorcycle schemes we believe that this means we offer the best quotation service around. Adrian Flux has been providing fast efficient scooter & bike insurance for years. In our 40 years in the business, we have become experts in providing cover for a wide variety of circumstances. We pride ourselves on our fast, efficient and cost-effective service. Why not give us a call and find out for yourself? We have the experience, the staff and the technology to provide you with a first class service, so whatever your circumstances, we can find a policy to suit you. Quicker & Cheaper rates by phone, please complete the call back form during office hours 9am to 7pm Monday to Friday & 9am to 4pm Saturday for a immediate quote, or buy motorcycle insurance online. 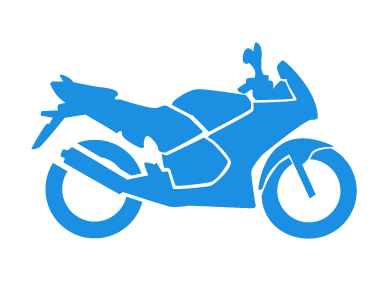 ** Sample quotes are for premiums as stated for a male rider with a clean license and full No Claims Bonus (unless stated otherwise) These illustrative quotes, valid as at 08/05/2006, are provided for information only and do not form the basis of any contract or tender.